Research shows that Philadelphians need to learn CPR. In fact, studies indicate Philadelphia falls behind other cities when it comes to administering this life-saving procedure. That is why it is imperative that Philadelphians begin looking at the importance of CPR training. Most people are under the impression that CPR is a practice that is confined to health care workers or people who work at athletic or sports facilities. However, CPR is a basic resuscitation method that everyone should know. CPR is easy to learn and can save countless lives. Plus, you can use hands-on CPR that does not include breaths. Some people are shy or wary about using mouth-to-mouth resuscitation. However, hands-on CPR makes it possible for you to save someone’s life and keep them breathing until help arrives. The more people who know CPR, the safer everyone will be. Both laypeople in Philadelphia and healthcare providers can benefit from CPR training. Training takes a minimal amount of time and enables a student to learn all there is to know about CPR – compressions, rescue breathing (if the class covers mouth-to-mouth resuscitation), and defibrillation. According to the Philadelphia Inquirer, about 1,100 Philadelphians lost their lives to cardiac arrest in 2015. Many of the deaths, which occurred in public places or at home, could have been avoided if hands-only cardiopulmonary resuscitation (CPR) has been used. Indeed, CPR is instrumental in saving lives, as it can be used in a variety of emergencies. CPR can be administered any time a person’s heart stops beating or if he or she suffers from a near-drowning. Again, hands-only CPR does not require that the lifesaver give mouth-to-mouth resuscitation or breaths and has been shown to be as effective as the traditional CPR for saving an individual from cardiac arrest in the workplace, in public, or at home. If the heart stops beating, any lack of oxygenated blood can lead to brain damage. This can happen in only several minutes. Moreover, an individual suffering from SCA can die in as little as 10 minutes. However, if CPR is administered, blood can still flow to the organs and brain until responders can provide the equipment needed to restore rhythm to the heart. Any bystander who knows hands-only CPR can be invaluable to a community. This process takes place in two steps. First, the bystander calls 911. He then pushes on the center of the victim’s chest—firmly, using quick compressions—until help arrives. The compression rate should be around 100 compressions per minute. Press over the chest at a depth of about two inches. Indeed, by-stander CPR is invaluable as well as training in the use of an automated external defibrillator (AED). An AED device is used to restore a heart that is beating abnormally. Cardiac arrest has become a community issue, as cardiac survival rates are unacceptable currently. When a wide range of people know how to administer CPR and use an AED, they can make a vital, if not far-reaching, difference. While the terms are often used interchangeably, a sudden cardiac arrest (SCA) and a heart attack are not the same thing. A heart attack happens when the circulation to an area of the heart is blocked by either an obstructed or narrow coronary artery. In turn, this blockage results in damage. Heart attack symptoms usually include dizziness, confusion, shortness of breath, or pain. An SCA happens when the electrical activity of a heart is disrupted, which causes the heart to stop beating. This disruption can result from a heart attack, an inherited condition, or an electrolyte imbalance. When an SCA occurs, the patient almost instantly loses consciousness. The treatment objective, for an SCA is to maintain blood flow and restore the heart’s rhythm. On the other hand, treatment for a heart attack entails reopening the arteries to clear blockages and o restore the blood’s flow. Therefore, when CPR is performed, the goal is to maintain the heart beat until emergency help can arrive. Again, knowing CPR is vital for both bystanders and medical workers, given the latest statistics – statistics that show that most SCAs happen in home settings with a witness present. The effective treatment of SCA requires an automatic response from lifesavers. Usually, this response is more likely to be successful if 911 is called, CPR is begun, and an AED is used. The time between the first chest compression and the SCA incident is critical. Survival rates decrease 10% for every minute CPR is delayed. Therefore, ever second is crucial – from the time of a collapse to the return of spontaneous blood flow. While evidence supports that bystander CPR knowledge along with the use of an AED can substantially increase SCA survival rates, only 3% of the entire US population currently is CPR trained. As a result, many laypeople or bystanders are not prepared to act. If you live in Philadelphia and want to give back to the community, learning CPR is valuable way to do so. When you are trained in CPR, you will be able to recognize an SCA and know how to respond accordingly. It does not take a long time to learn CPR. Therefore, you do not have any reason not to make time to do so. A knowledge of CPR can also be used in emergency situations in the areas of disaster safety, weather safety, water safety, and children’s safety. While courses for CPR are given in schools and to healthcare providers and employees, they are open, as well, for people who wish to learn how to provide life support using this method. CPR training applies to the resuscitation of pets, babies, children, and adults. Learning hands-on CPR is ideal for bystanders as it easy to retain and remember. Before giving hands-on CPR, responders or bystanders should first look around them, checking the environment and the person. Make sure it is safe for you to continue. Tap the individual on his or her shoulder and ask if he or she is okay. Check to see if they are breathing normally. In some situations, a bystander may become too exhausted to continue. However, if another bystander is present who know CPR, the activity can continue until an AED can be used or an emergency responder arrives. Can you see why it is important for everyone to learn CPR? Even in a situation where there is no medical personnel, a life can be saved if people are CPR trained. 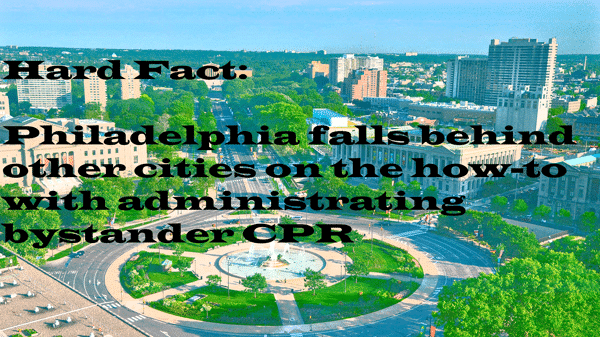 Statistics reveal that Philadelphia falls behind other cities when it comes to CPR education. According to an article in The Inquirer in Philadelphia, the city’s need for CPR training is acute. The article added that CPR, when performed within minutes of an SCA, can double or triple an individual’s chance of survival. Indeed, every minute counts when a person falls victim to an SCA. That is why everybody needs to know CPR. An SCA does not just happen in sports facilities, on athletic fields, where people swim, or in the hospital. It often happens at home or can occur in the workplace. The American Heart Association has a CPR class this week near you! Isn’t learning CPR the ideal way to show the type of care that Philadelphians are known to possess? In a short matter of time, you can be certified in CPR. You only need to sign up for a class and start learning. The sooner you do so, the sooner you will realize how CPR can indeed make a difference in your life and to someone who may need your help one day.